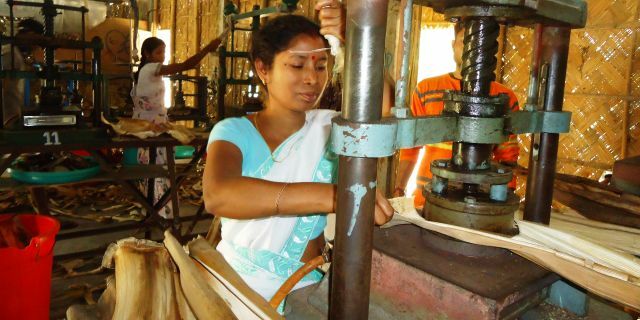 Anju Roy is one of the rural women that have work and an income thanks to Tamul Plates in Barpeta, Assam. Anju is a fortunate rural woman. Prabhat, her husband, owns his own tamul plates production unit. Together, they are working for the education for their three children. They have one son and two daughters, one of whom aspires to be a teacher, and the other a police officer. Assam’s employment opportunities are inadequate and inaccessible. Unemployment rates are increasing and economic growth is limited to the cities. Alternatives to agricultural employment are focused in major cities, fueling a prominent urban/rural economic gap. Unemployment is the root cause of increasing crime and terrorism in the Northeast. The way out is creating employment opportunities for rural communities. Tamul Plates Manufacturing Pvt. Ltd. is a green, social enterprise that produces and markets high-quality, all-natural disposable plates and bowls made from arecanut (palm) tree sheaths. With over 100,000 hectares of arecanut currently farmed across Northeast India, tableware production could become a major year-round employer in poor tribal communities across the Northeast. The supply chain and production is local and women-centric, allowing the women to engage in livelihood within their context. Tamul Plates believes that generating jobs for women and youths transforms their lives and drive social change.